Donna Jean Hladky was born to John and Nona (Jensen) Barnes on November 5, 1936 in Gordon, Nebraska. She passed away on March 16, 2019, at the CHI Immanuel Hospital in Omaha. 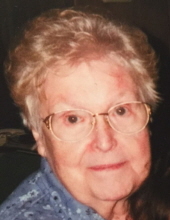 She attended country schools in Pierce county, graduating from Plainview High School in 1953. After obtaining a teaching certificate from Wayne State College, she taught country schools in Pierce county for several years. She attended Dana College and earned a Bachelor's degree in Accountancy in 1996. She married Raymond Hladky in Plainview, Nebraska on December 19, 1958. They lived for 10 years in North Bend before moving to Tekamah in 1970. She worked at H&R Block, Wragge's Drug Store, Larry's Body Shop, and several other locations in Tekamah. She enjoyed reading, crocheting, and socializing with friends. She was preceded in death by her parents, sisters Norma Ruterbories and Marjorie Friedrich, and brother James Barnes. Survivors include her husband of 60 years Raymond Hladky of Tekamah; two sons and one daughter: Kenneth of Escondido CA, Kathryn of Tekamah, John (I Hwa) of Colorado Springs CO; brother, Herbert Barnes of Wahoo; sister, Betty Kubica of Jewett City CT; four grandchildren: Jacqueline, James, Rayna, and Veona; many nieces, nephews, and cousins. Family will receive friends 5-7 pm. Visitation will also be held one hour prior to services at the church. "Email Address" would like to share the life celebration of Donna J. Hladky. Click on the "link" to go to share a favorite memory or leave a condolence message for the family.